Determine the coefficient of permeability for laminar flow of water through granular soils. For use with granular soils in determining the coefficient of permeability . Perform permeability tests within a Shelby tube without removing the sample. Economical dual-manometer tube setup for use with many permeameters. Economical single-manometer tube setup for use with many permeameters. Acrylic tank with regulating valve for flow control of water and a porous media on bottom to filter out air bubbles. 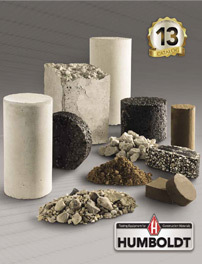 For determining permeability of clay, sand, and gravel soils.